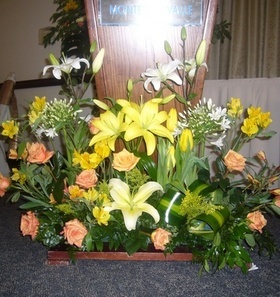 A gorgeous Garden Look for your altar, podium, base of your head table, or elsewhere! Description:A combination of Lilies, Agapanthus, roses, tulips, alstroemerias and various greens to accentuate its beauty. It´s a one-sided arrangement that is ideal for the front of any table or altar. Colours can be changed.